The chances are good that when you ask a senior microbiologist how he or she got into this science, they will tell you that they were influenced as teenagers by reading “Microbe Hunters.” I was about 14 years old when I did, and I became transfixed by the glorious and intrepid achievements of our forefathers, told in a jaunty and florid style. There was nothing else I wanted to do with myself than to become a Microbe Hunter. This book was written in 1926, two years before my birth, by the microbiologist Paul DeKruif, whose career was as checkered as it was unusual. He graduated in 1916 from University of Michigan with a PhD in microbiology and, after World War I, got the job at the Rockefeller Institute. This, however, did not last long because his lifestyle included writing for the general public, which at the time was frowned upon by the establishment. He also hung out with such suspect characters as Carl Sandburg, H.L. Mencken, and Sinclair Lewis, of whom he became a welcome drinking companion. DeKruif became the source of microbiological information for Lewis’ best-selling book, Arrowsmith. In this book, a somewhat persecuted microbiologist works on developing phage therapy in a lab he had built in his own home. Figure 2. Paul DeKruif. Source. ”Microbe Hunters” rapidly became a huge success. It was translated into all major languages and inspired two Hollywood movies. It still sells well. But for all its appeal, it received serious criticism. DeKruif wrote in a “jazz style,” where bravura at times seems to be more important that the facts. To make the narrative conform to his “voice,” DeKruif not only made up dialog from whole cloth but also took liberties with the facts. So much so that one of the people depicted in the book, the British microbiologist Ronald Ross, threated a lawsuit. The matter was resolved by omitting the chapter on Ross from the British edition! But such thorny facts do not detract from the impact of the book. As I can attest, if you read it at a susceptible time of life, you will be carried away by the pungency of the tales, the spirited portrayal of the protagonists and the glory of the achievements. 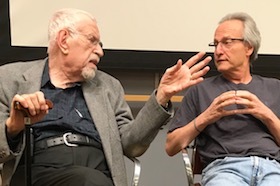 For more on the book and its author, click here for an article by Robin Marantz Henig and here for a video clip of a lecture by John M. Lehman.